Spiritual practices offer ways to journey and grow deeper to the one we call the Divine. Christian spiritual practices “are things Christians do together over time in response to and in light of God’s active presence for the life of the world.” (www.practicingourfaith.org). They are intentional practices that can be done individually and communally. All are invited to come and walk the Labyrinth. Walks coinciding with the equinoxes will be scheduled for 2019. 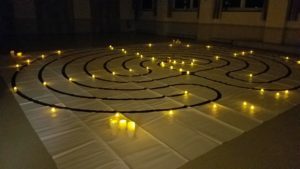 The labyrinth is an ancient spiritual practice used by many faith and spiritual traditions. This spiritual practice is a form of body prayer which offers inspiration, guidance, meditation, contemplation, relaxation, clarification, wholeness, and healing for many. The labyrinth is not a maze. The three basic stages to this contemplative walk are: entering or walking into the labyrinth – a time to let go of distractions; centering – a time in the center to be still and silent to listen for God; exiting from the center – a time to gain direction, comfort, new energy – a time to move toward peace and a deeper relationship with the Divine. The opportunities offered by two of our lay members trained in the Mindfulness-Based Stress Reduction program (one an international trainer) are very popular. Centering prayer is a way of cultivating a deeper relationship with God. 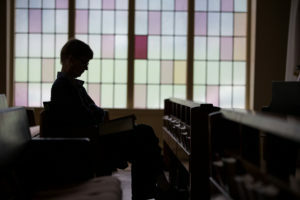 Four basic guidelines for this type of prayer involve choosing a sacred word as consent for God’s presence within you, sitting comfortably with eyes closed, disengaging incoming thoughts and sensations by reintroducing your sacred word, and then ending the period of prayer by remaining in silence for several more minutes. For more information visit www.contemplativeoutreach.org. From the Latin root meaning “divine reading,” this practice is a 4 step movement to reading scripture: read (lectio) – read and listen for a word or phrase that calls to you in the present moment; reflect (meditatio) – savor the word and allow it to unfold within you; respond (oratio) – listen for the invitation; rest (contemplatio) – take repose in stillness. While practicing lectio, any distractions that arise should be gently released without judgment. This practice involves gradually letting go of our own agenda and opening ourselves to what God may be saying to us. For more information visit www.contemplativeoutreach.org. From the Latin meaning “divine seeing,” this practice shares roots with the ancient practice of lectio divina. Visio divina invites one to encounter the divine through images. Steps include: prayerful gazing on a photograph, icon, piece of art or other visual representation; noticing a place on the image where your eye is invited to rest; responding to an invitation emerging within; resting in the experience of stillness and being in the presence of God.